Framing Military Medals has become a passion of ours. 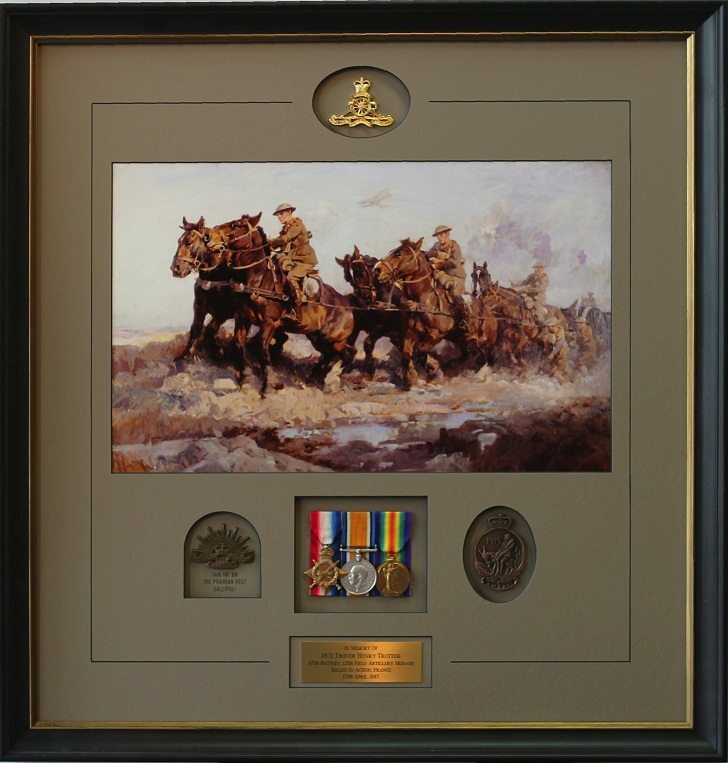 The framing of military medals and the accompanying photographs and memorabilia tells a story about the recipient and their time in history. We pride ourselves on our attention to detail and commitment to respecting the recipients memory. To present your medals in the best possible light, firstly they need to be professionally Court Mounted. Court Mounting is a process where the medals are hand stitched securely to a backing board which is wrapped with the medal ribbon. Court Mounting was originally devised because Queen Victoria didn’t like the noise from her courtier’s medals ‘chinking’ together. In a frame, Court Mounting ensures that the medals are secured and do not swing and hit the glazing. All our Court Mounting is professionally done by David Hirsh of David Hirsh Medal Mounting. Next, we need to design the layout of the frame, complete with medals, photographs and memorabilia so that they tell the story of the medals in an aesthetically pleasing way. Often the photographs and memorabilia are in poor condition and will need to be restored and reprinted. To finish off the framing of the military medals, we like to include a brass plaque. We can have the brass plaque engraved with the medal recipients details or description of their accomplishments. The brass plaques are similar to those used in museums and art galleries and makes a great addition to framed military medals. The Australian Department of Defence has excellent websites where you can research your families military history. For World War II serviceman and women, their individual service records can be accessed at the WWII Nominal Roll.